Suzie’s daughter Molly is a ten-year-old girl, who thinks she has been stolen, and that her real parents are the ones looking for their child, a girl called Phoebe who was kidnapped some time ago and never found. Suzie herself was given up for adoption forty-four years ago by her mother, Janice. Six months ago, Suzie decided to get in contact with her real mother, but the letter was opened by Janice’s brother Dan. One thing led to another, and Suzie went to live with Dan at the Old Rectory in Norfolk. But now Dan, only sixty-six years old has died suddenly, and Suzie has to call Janice to introduce herself for the first time, and to give her the bad news about her brother. Why would a sixty-six-year-old man apparently die in his sleep: a natural death, or not? How will Janice cope with meeting her daughter for the first time, and her grand daughter Molly? And what is Joe Vincent, the band member that Janice used to hang out with back in the late 60s doing living just down the road from the Rectory? It’s the start of a long complex unravelling story with a theme of missing young girls. It reaches deep into the past, uncovering the story of the men in the band that Janice used to hang out with back in the 60s. Part of the story telling is driven forward by Molly, who finally decides to ‘escape’ and find her real parents. As Janice and Suzie try to find her, Janice starts to uncover some unexpected links to her own family past, secrets and lies, the truth untold, as she is lifted out of her comfortable existence, and also has to find out how all of this is linked into what happened to Dan. 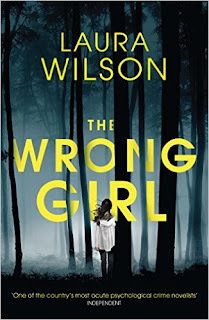 THE WRONG GIRL is an interesting and well told story, with Janice a rather unlikely heroine, driven forward by circumstances towards a dramatic denouement.